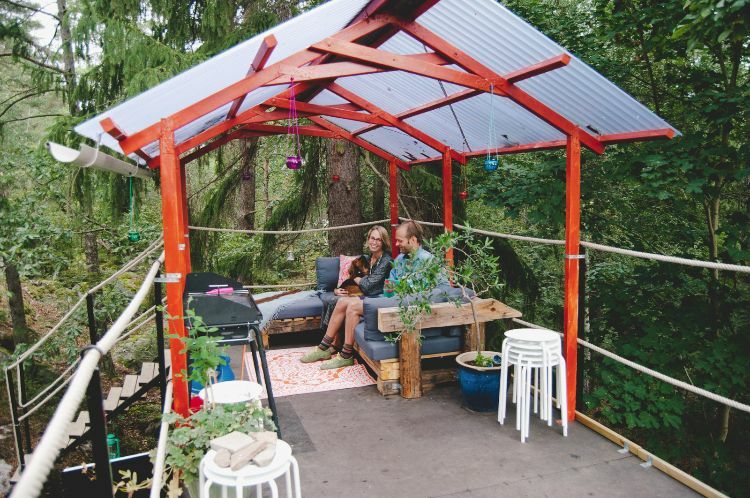 Creative spirits Jon Backlund and Stina Ekstrom of Stockholm decided to put their collective vision into a cool project: converting a 1976 school bus into a small home. 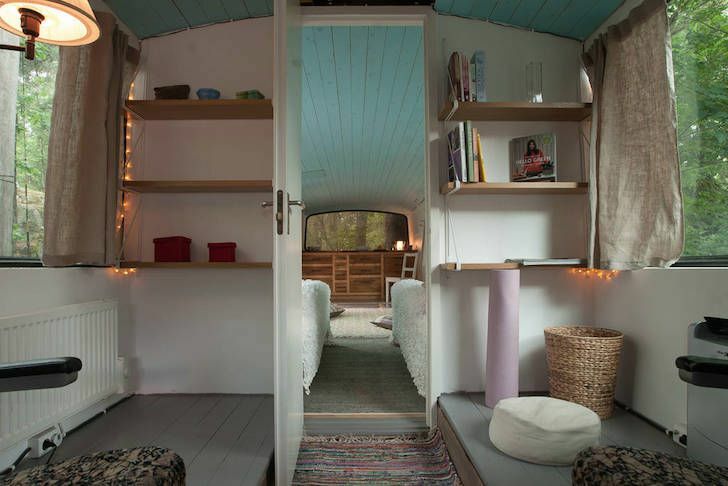 The couple rents the home to visitors to the area and guests enjoy the peace and quiet the beautiful bus allows them. 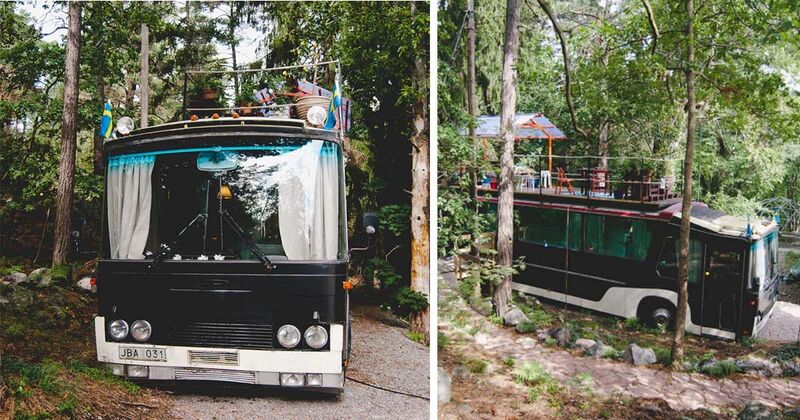 The elaborately designed bus features amenities like a roof deck and an outdoors grill, making it fun and easy to enjoy the scenery of Sweden while tucked away in a small forest environment. 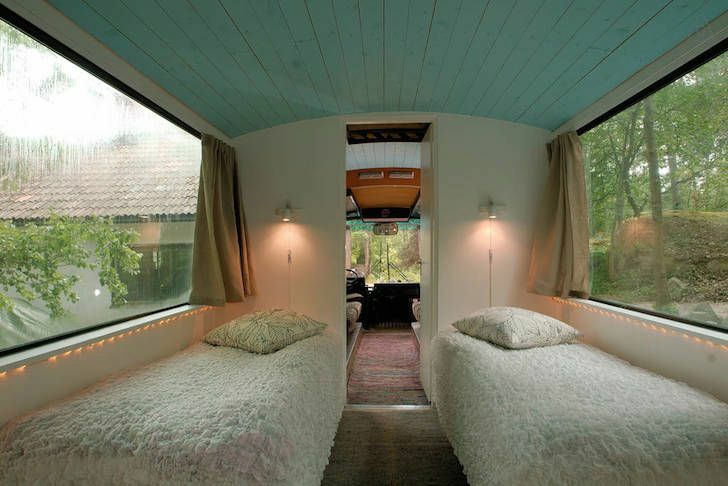 Soft lighting, cozy bedding, and tranquil colors make the bus's interior a dreamy place to sleep and relax. 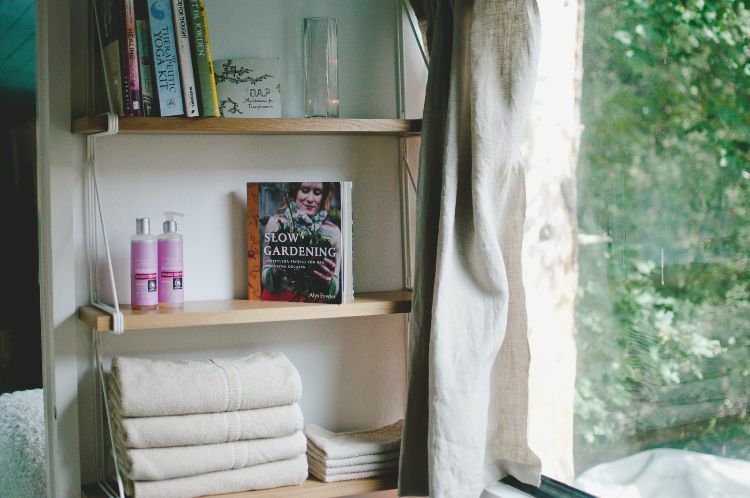 Upon entering the bus, you'll immediately feel cozy, comfortable, and right at home. The front of the bus contains the living/sitting area, which is essentially just the bus's original seats, cleverly made into two oversized sofas, offering plenty of room for lounging. 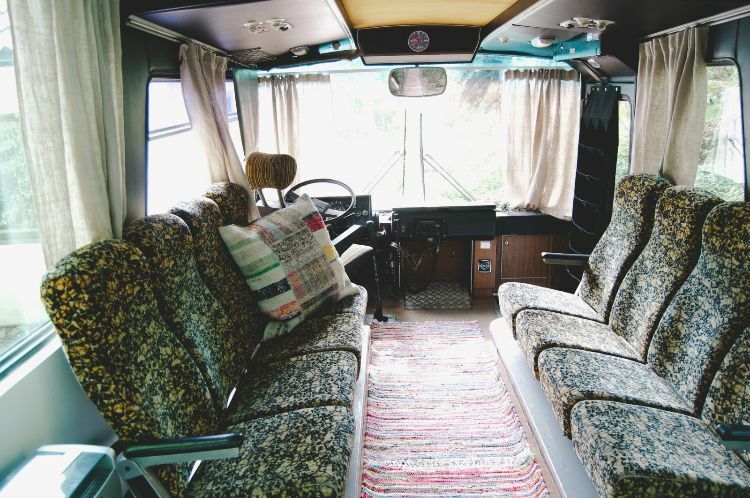 Floor cushions and a colorful rug decorate the bus, and the center of the bus offers shelves and storage space. 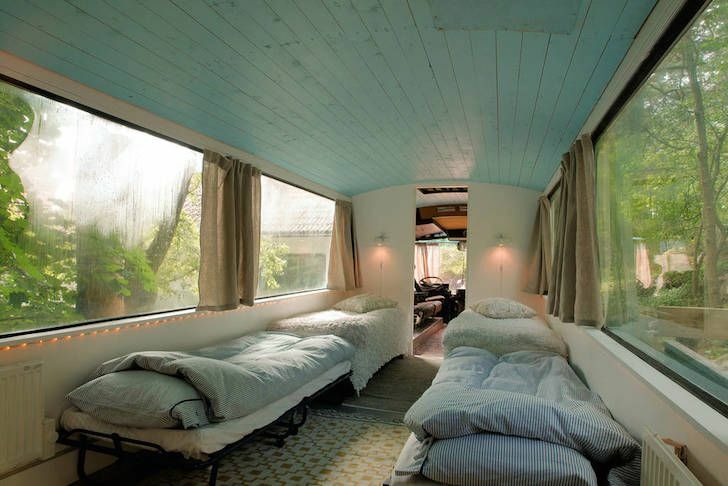 A door leads to the sleeping portion of the bus and adds a bit of privacy. The sleeping space contains two beds that sleep two people, along with warm, soft bedding and plenty of cushions. 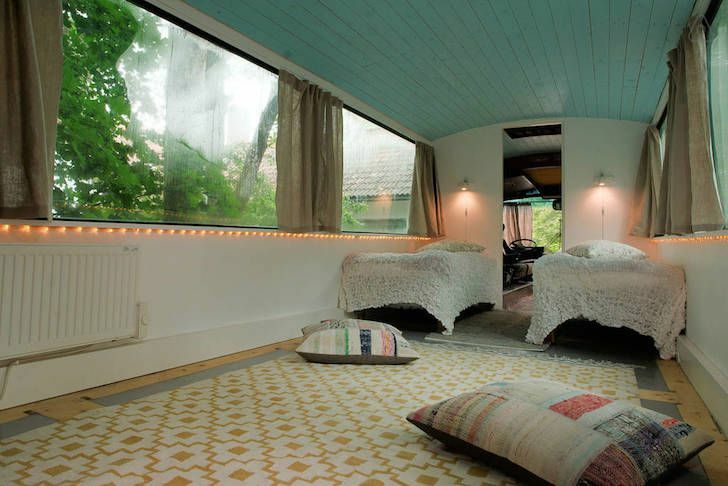 The bus windows let in natural light during the day, but can be covered with curtains in the evening. For extra guests, there are two additional beds that can be used to create sleeping space for four. Towards the back of the bedroom area, there is a built-in, handmade wooden dresser. 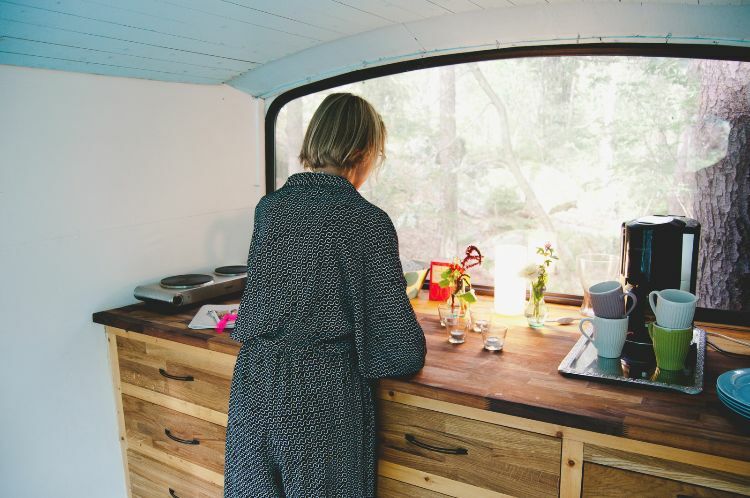 This dresser can also double as an impromptu kitchen space, with the addition of a hot plate, coffee pot, and other small kitchen necessities to create a cup of coffee, tea, or small meal on the spot. Though the bus itself doesn't have a bathroom, the couple has a bathroom onsite and everything guests require is provided. There are a couple of reasons that this bus is unlike other bus conversions, and these features will enhance anyone's stay. The first amenity is a hot tub. Yes, there is an actual hot tub behind the bus! 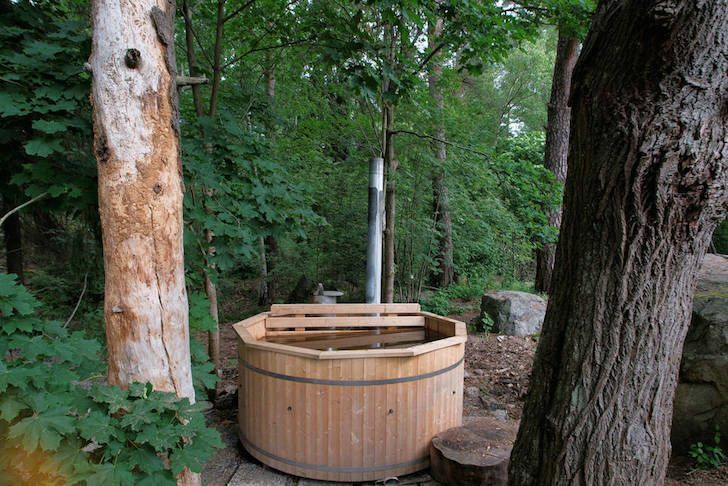 Soak your cares away after a day of Swedish sightseeing in this toasty tub. The other standout feature of the bus is the rooftop deck. 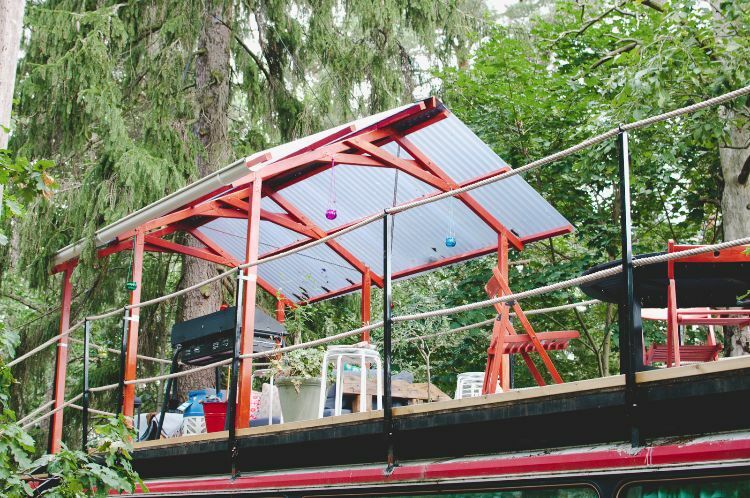 Not only is the deck beautiful, but it offers a sofa, awning to keep the sun away, a table and chairs, and a grill. 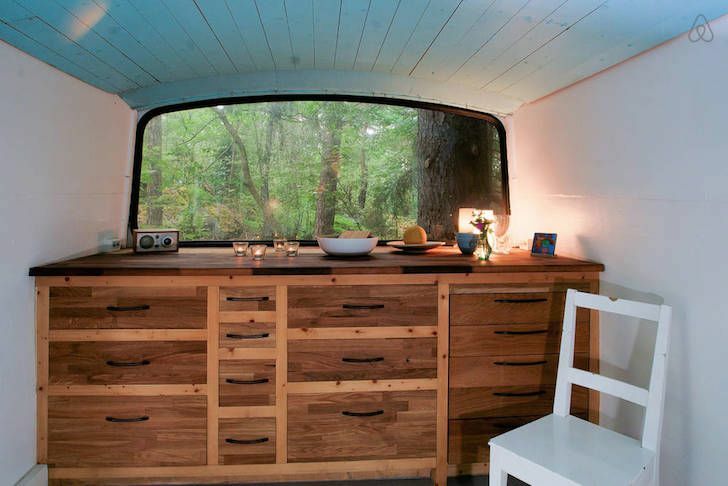 It's a great spot to serve up a meal and relax in the fresh air, and makes the bus really stand out. Once the sun goes down, the deck is a quiet, cool place to spend time and truly feel you are getting away from it all. 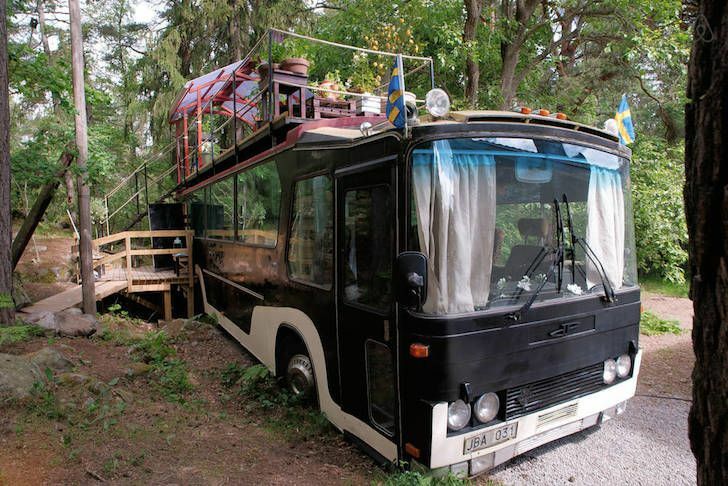 If you're visiting Stockholm and wish to have a unique experience, consider sleeping on a converted bus; your vacation will truly be unlike any other!